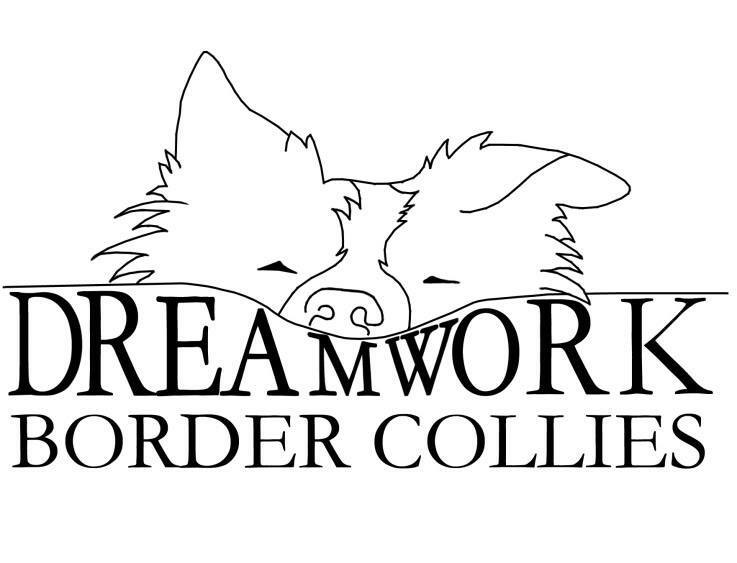 Dreamwork 6 came into the world on 5 December 2014. This is the first time we had to look for an external stud dog. Denver took a long time to find, but he was worth the wait and he and Muse have given us five delicious puppies, including our first black and white and blue merle pups. The litter was Sniper, TicToc, Drama, Rumor and Arrow. The girls are pictured. 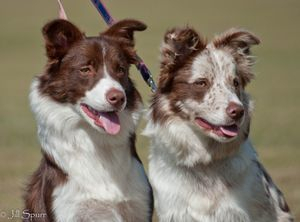 Dreamwork 5 was our first 'second generation' litter, from Dante and Lacey. Again there were six: Remy, Sidney, Chi, Sky, Ti and Dj (Dante Jnr). Pictured is Chi with her dad and grandad - three generations of merles. Dreamwork 4 was born on Matisse's 10th birthday - 13 January, 2012. They were a week late, and the birth was tough on Dali. This was always planned to be Dali's last litter, and she gave us: Eddie, Mystic, Muse, Ron, Daytona (pictured) and Eira. Dreamwork 3 were born on Boxing Day, 2009. 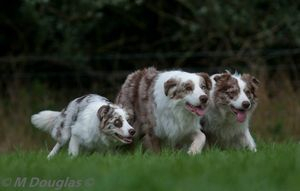 This was Dali's second litter, and Dee and Misty her first daughters. 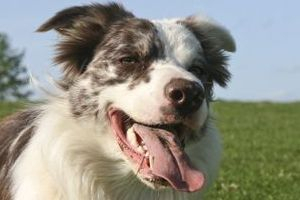 Travis the only red and white male was born first, and we had three merle males: Evo (pictured), Kez and Harry. Dreamwork 2 came along on 25 May, 2009. Another litter of four, Kia and Vixn became our first girls, merle and red respectively, along with Solo and Dazzle. 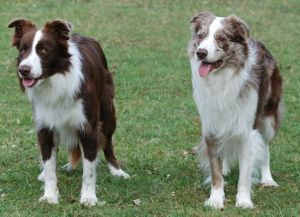 Pictured is Solo, with his father DJ, who competes in agility. Dreamwork1 were born on 20 April, 2008, and gave us four bouncy, cheeky boys: George, Stanley, Dante and Toby. George, or Gorgeous as he tends to be known, is pictured. Sadly, Stanley lost his life in a house fire in December 2012. His family have since adopted Sidney, Dante's son and Stanley's nephew. A special moment - in 2010, we managed to get nine of our pups together in one place at the same time! We didn't manage to get them all plus their parents to look at the cameral at the same time though, but we weren't far off! Made all the more precious now as Kez, DW Lightning Thief, went to Rainbow Bridge in May 2014, following a tragic accident. L-R: Toby, Daz, Dee, Travis (in arms), Solo, Evo, Vixn, Dante, Kez, Dali, Lulu and Dj. DW1 (Toby and Dante) are just two, DW2 (Daz, Solo and Vixn) are 11 months and DW3 (Dee, Travis, Evo and Kez) are four months.